I stand in front of the children and say “Here is the pattern.” I begin to move the wind wand. “Pretend you have a wind wand and do the pattern with me.” I sing the song (We believe that through the Atonement…) and do the wind wand pattern again as I sing. The children copy my movements even though they don’t have a wind wand. Ask several adults to pass out the wind wands. Make sure the children know to use them appropriately (not touching anyone else with their wind wand). 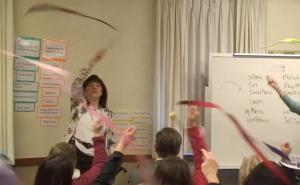 If you only have a few wind wands, ask some children to come to the front and do the pattern with you as you sing. Tell the others we will take turns. When you have finished, ask the children with wind wands to give it someone else who has never had the wind wands yet. Do this three or four times, each time singing the song and doing the wind wand pattern with new children. If you have enough for the whole Primary, ask the children to move to a place where their ribbons will not touch another person (that takes some doing.) Sing the song and do the pattern. Now ask the children if there are three people who know the pattern well enough to come and lead the whole group. Sing the song, having those children lead the group in the wind wand pattern. The colors and movement of the ribbon to the steady beat, the physical big motor movement, and the song added in make this a magical experience. It is great for the practice of steady beat. It is great for kinesthetic movement of the body to the song. It is great for stimulation by color and movement to associate with the song. And it is fun! I did this today and the kids loved it! I also did the mirror idea from “Come Follow Me” but with “I’m Trying to Be Like Jesus” with senior primary and it also went very well. It was very cool to watch! I love how all of your ideas always end in success. I know it must take so much work to post and keep this website updated, but so many kids are benefiting and feeling the spirit. Thank you so much! Thank you so much for sharing all your wonderful ideas that keep the children engaged. I know it must take a ton of time and I want you to know I appreciate all your hard work and talent. Thank you !!! Thanks! I’m going to use this to teach the 3rd verse of Praise to the Man for my juniors. I like that it also has a steady beat – I hope it goes well! I did your action words to help them with the first verse and it was awesome! Thank you for sharing your knowledge and talent. Dear Pi’ikea, I think this will be fun for them. You might also on another week do the 3rd verse with the Action word actions, too. I just put the video up today. Thank you for so many wonderful ideas! I am making wind wands but I ran into a couple problems. Do you know where I can find nylon twine that is thin and strong enough to use? Also, I wonder where you get your ribbon? 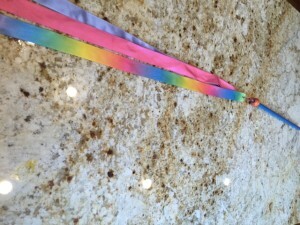 My ribbon seems to thick to get a grommet through 3-4 ribbons, and impossible to fold over as suggested in the wind wand instructions sheet. Any suggestions? I am excited to try them out! Thanks again. Dear Angela, I used fishing line for the twine. I had to poke a hole with something very sharp into the ribbons first, then put the grommet in. I have a friend who is making some this month who said she has a tool that is perfect. I will ask her what it is!